In cold climates, even in Australia many gardeners steer away from Orchids, however many species cope well with cooler climate and they are available for sale in Australia. 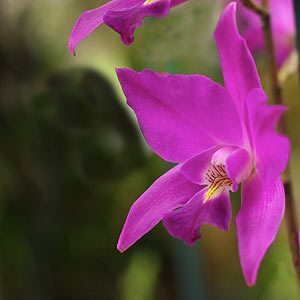 Sometimes it is the orchids that grow at elevations in tropical climates that do well in cooler climates, these are mainly epiphytic types that grow in the Cloud Forests which are mossy forested areas at elevations, often covered by cloud. However many cool growing orchids grow in cool areas well away from the tropics. Some of the easiest cool climate orchids include the Australian species Dendrobium kingianum. Masdevallias are another easy species. Laelia gouldiana, pictured right and Laelia anceps are two excellent and easy species to try. Cool climate orchids come from areas that are naturally cool, and this includes orchids from tropical areas, that grow high in the mountains. Some are very easy to grow and these include many well known species. Others are a little more difficult, as although they grow in cool climates, they do require a degree of humidity. Masdevallia orchids are a favourite cool growing or ‘cool climate’ orchid, however others include species such as Odontoglossums, Cymbidiums, Laelia and Draculas Orchids, all are a mostly cool growing orchid species. We provide a guide to orchids suitable for growing the cooler climate type orchids in Australia. Like all orchids cool growing orchid types thrive on regular fertilising and in a suitable potting mix. We suggest a specialist orchid fertilizer. Cool growing orchids generally prefer a shaded position. Epiphytic Plant Specialists, stocking tree fern, staghorn/elkhorn ferns, general ferns, bromeliads and cool growing orchids.